About a couple of years ago, my sister-in-law (who lives in Belgium), got nostalgic for her NY bagels and started making her own. My husband promptly volunteered me to try and make bagels too. 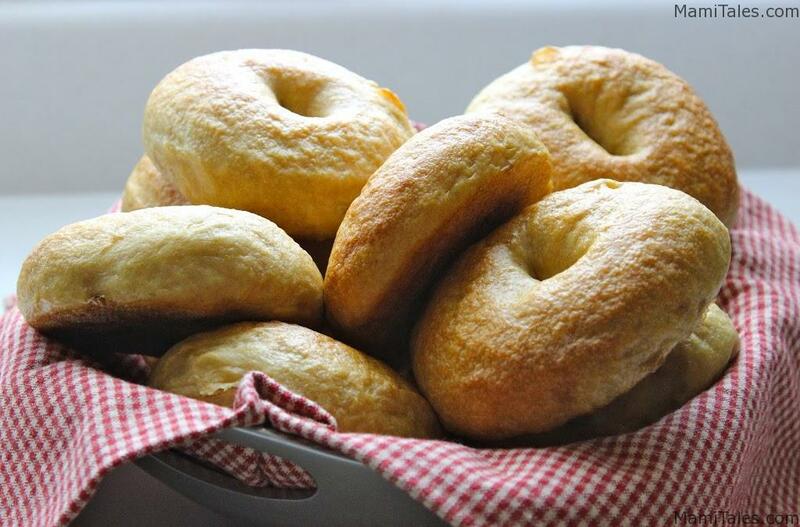 Chewy NY style Bagels made with ingredients you can find in any US supermarket. Remove the plastic wrap and stir the additional yeast into the sponge. Add 1/2 cup of flour, the molasses, and the salt into the bowl and mix until all of the ingredients form a ball. Add the rest of the flour 1/2 cup at the time, until you feel the dough tacky, not dry. It feels stiffer than regular bread dough, but definitely not dry. Knead the dough until it springs back when pressed. Immediately after kneading, split the dough into a dozen small pieces. Roll each piece into a ball and set it aside. When you have all 12 pieces made, cover them with a damp towel and let them rest for 20-25 minutes. Then you need to shape the bagels. Shaping is super easy: punch your thumb through the center of each roll and then rotate the dough, working it so that the bagel is as even in width as possible. Place the shaped bagels on an oiled sheet pan, with an inch or so of space between one another. If you have parchment paper, line the sheet pan with parchment and spray it lightly with oil before placing the bagels on the pan. If you have a silpat mat, you don't need to oil it at all (this is the one I use). Cover the pan with plastic and allow the dough to rise for about 20 minutes. I use two sheets of Glad's Press n'seal to prevent the moisture from escaping. Place in the refrigerator overnight, or at least 8 hours. Preheat the oven to 500F. Bring a large pot of water to a boil. Adding one tablespoon of baking soda to the pot to alkalize the water is suggested to replicate traditional bagel shop flavor. I also dissolve a TBS of molasses in there. When the pot is boiling, drop a few of the bagels into the pot one at a time and let them boil for a minute. Use a large, slotted spoon or spatula to gently flip them over and boil them on the other side for another minute. Before removing them from the pot, sprinkle corn meal onto the sheet pan. If you're using a silpat, there's no need to do this. Remove them one at a time, set them back onto the sheet pan, and top them right away, while they are still slightly moist. Repeat this process until all of the bagels have been boiled and topped. Once they have, place the sheet pan into the preheated oven and bake for 6 minutes. Reduce the heat to 450F, rotate the pan, and bake for another 5 minutes until the bagels begin to brown. Remove the pan from the oven and cool off. Enjoy! Tagged Baking and Cooking, Home made bread. « How to deal with conflict in the Kindergarten classroom.